There's a longstanding question in cultural studies that can never be definitively answered: How important is knowing an artist's biography to appreciating a piece of art? Think of Beethoven. His Symphony No. 9 is considered one of the greatest compositions in the western musical canon. Does knowing that he was completely deaf when he wrote this monumental piece deepen our relation to it? And what about Van Gogh? Do his hypnotic swirls look swirlier because of his self-mutilation and suicide? While we're at it, let's consider Frida Kahlo too: Would her legions of fans be so ardent about her paintings if they didn't know of her tempestuous backstory and protofeminism? Understanding the life is often inseparable from enjoying the work. But what about chefs? Even with the rise of the celebrity chef culture and tens, if not hundreds, of cooking competition TV programs, a chef's backstory is usually not invoked. Who among us knows the personal history of Thomas Keller or David Chang? All I know is that I want to eat at the French Laundry and Momofuku—we don't need to know where they grew up. It's all about the preparation of the food and what ends up on the plate. And, with increasingly frequency, the provenance of the food itself is paramount, with chefs in farm-to-table restaurants seemingly wanting to disappear altogether in simple, refined preparations designed to highlight ingredients, be it carrots or wild boar. Given the way in which we typically experience restaurants—food is served without elaborate explanation; the kitchen staff is not seen, creating magic in the kitchen like the wizard in The Wizard of Oz—it's not surprising that more emphasis is not placed on a chef's biography. And let's be honest, eating out isn't cheap. If I'm paying $20 or more for an entrée (now standard Hudson Valley pricing), the meal better be tasty (sadly, not standard). No amount of backstory is going to save a plate of soggy risotto. Sometimes, however, context is everything. Meet Makio Idesako, chef/owner of SushiMakio, a sushi restaurant tucked away on Morton Boulevard in Kingston. Idesako grew up a self-described "country boy" from a fishing village in Kagoshima Prefecture, at Japan's southern tip, an area famous for its tuna. Needing money while attending college, he took a job in a restaurant and spent the next 10 years training to be a sushi chef. According to Idesako, he only handled rice the first year of his apprenticeship; he wasn't allowed to cut fish until much later. Arriving in New York City in 1972, Idesako worked in a few trend-setting Japanese restaurants like Tokubei 86 and Café Seiyoken (Warhol and Bowie were regulars) before decamping to Westchester to open his own place, Satsuma-Ya, in Mamaroneck in 1989. After a successful 15-year run, Idesako sold the business and did some consulting work. 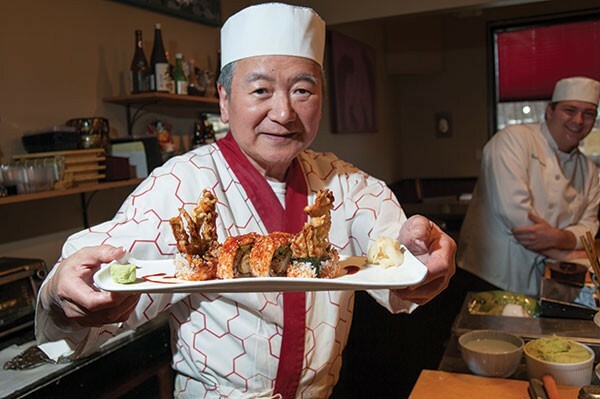 It wasn't long before his old friend, John Novi, of Depuy Canal House fame, invited Idesako to set up a sushi bar in his subterranean wood-fired pizza restaurant, Chefs on Fire in High Falls. Asked why he asked Idesako to join him, Novi says, "His creations are just fantastic. Some of the dishes he produces you can't get anyplace else. He really knows the art of sushi and sashimi." After three years with Novi, then a stint at the ill-fated Bull and Buddha in Poughkeepsie, Idesako was back to consulting. 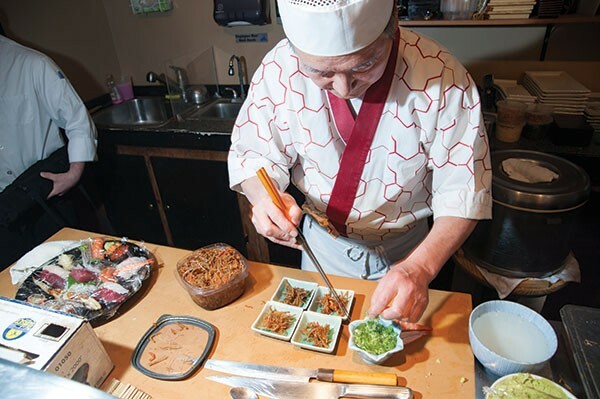 What's a restless 63-year-old sushi master to do? Open another restaurant, of course. 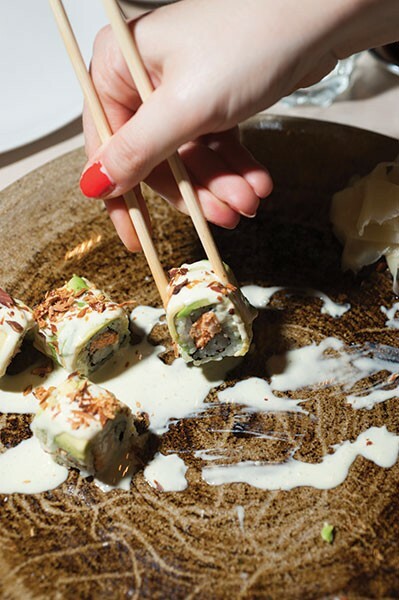 We eat first with our eyes, as the saying goes, and the plates at SushiMakio emanate the spare, sculptural aesthetics associated with ikebana and bonsai. Let's start with tamago, the traditional semi-sweet Japanese omelet made from several layers of cooked egg mixed with vinegar, sake, and soy sauce. It's labor-intensive to produce. 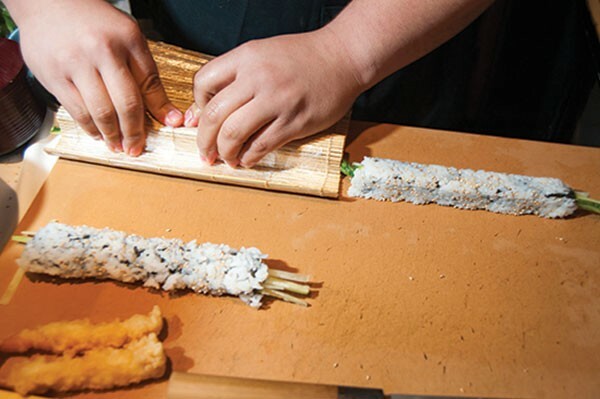 Sushi is big business in the US: total annual industry revenue is $2.25 billion. This has led to a rapidly expanding industry that often cuts corners—leading restaurants to import pre-made tamago. The tamago at SushiMakio does not have the perfectly bright yellow color and perfectly beveled corners of factory-made food. Idesako's omelet has bumps and ridges—just enough to satisfy the yearning for wabi-sabi—but it tastes earthy and grounded, with a hint of sweetness, like the tiniest touch of ethereal sugar. Now let's talk about the monkfish liver. It was served as part of the first dish in the nine-course omekase dinner I ate at SushiMakio recently. (Omekase is a Japanese-style chef's choice tasting menu that usually consists of six or seven courses. I went a little overboard.) The monkfish liver was crumbly in texture and served in a ponzu sauce with broom corn seeds, also known as field caviar. The liver wasn't fishy, almost recalling the umami-rich taste of shad roe, complemented by the tiny crunch of the broom corn seeds. Nothing I would ever order on my own, but an unexpected and balanced dish. 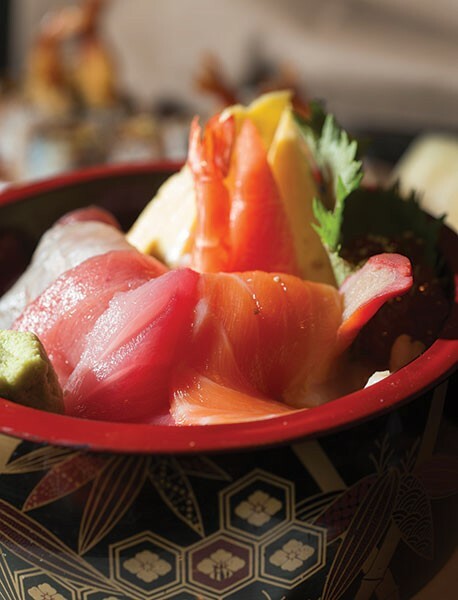 A note about omekase: It's mostly little bits of uncooked fish, but bring your appetite. It adds up. Here's dishes two through nine in my omekase odyssey: 2) sunomono: lobster, clam, shrimp, and octopus served on a wakame, cucumber, and radish salad; 3) sashimi: pieces of tuna, cobia, cured salmon, skipjack, and yellowtail; 4) baigai: Japanese sea snails steamed in sake and soy sauce and served with the piping hot liquid in the shell; 5) broiled cod marinated in miso for four days and tasting silky like tofu; 6) Fried yum: a spider roll featuring crunchy shrimp; 7) Wagyu beef: thin slices of coddled cow hit with a blowtorch and served with a burnt chili glaze; 8) finally, the sushi: Bluefin tuna belly; dorado, salmon, cured mackerel; amberjack, eel, and uni (sea urchin); 9) mochi ice cream: pounded sticky rice around ice cream, like dumplings. When the sushi course (#8) was set down, I texted my colleague: "Makio is trying to kill me—in the best way." 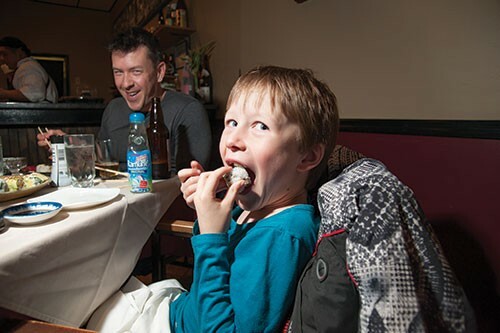 Trying to decide what's best at SushiMakio is a bit like choosing between your children: they're all delicious. Wait, that's not right. 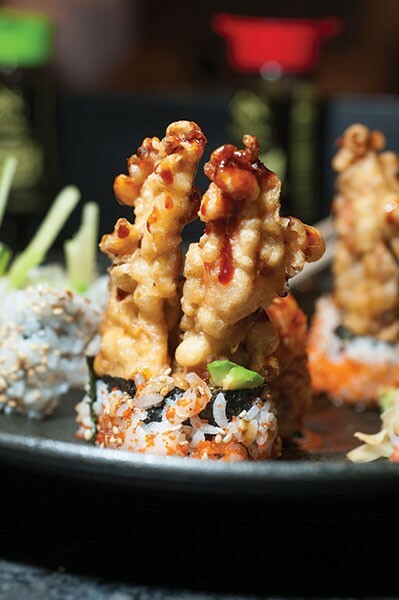 What I mean to say is: At SushiMakio, you are in the master's hands. The fish is fresh and clear tasting and the prepared foods are made in-house according to time-honored methods. Idesako's backstory says it all: Almost 50 years devoted to art form that we can eat five nights a week. Get it while you can. Dinner, Tuesdays through Thursdays, 4pm to 9pm; dinner, Fridays and Saturdays, 4pm to 10pm. 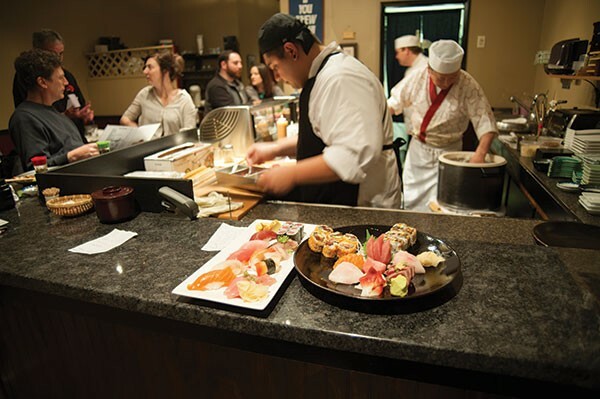 Omakase dinners are available by reservation only and served at the sushi bar, approximately $75 per person.